Around the world millions of children are not getting a proper education because their families are too poor to afford to send them to school. In India, one schoolboy is trying change that. In the first report in the BBC’s Hunger to Learn series, Damian Grammaticas meets Babar Ali, whose remarkable education project is transforming the lives of hundreds of poor children. At 16 years old, Babar Ali must be the youngest headmaster in the world. He’s a teenager who is in charge of teaching hundreds of students in his family’s backyard, where he runs classes for poor children from his village. The story of this young man from Murshidabad in West Bengal is a remarkable tale of the desire to learn amid the direst poverty. Babar Ali’s day starts early. He wakes, pitches in with the household chores, then jumps on an auto-rickshaw which takes him part of the 10km (six mile) ride to the Raj Govinda school. The last couple of kilometres he has to walk. The school is the best in this part of West Bengal. There are hundreds of students, boys and girls. The classrooms are neat, if bare. But there are desks, chairs, a blackboard, and the teachers are all dedicated and well-qualified. As the class 12 roll-call is taken, Babar Ali is seated in the middle in the front row. He’s a tall, slim, gangly teenager, studious and smart in his blue and white uniform. He takes his notes carefully. He is the model student. Babar Ali is the first member of his family ever to get a proper education. Raj Govinda school is government-run so it is free, all Babar Ali has to pay for is his uniform, his books and the rickshaw ride to get there. But still that means his family has to find around 1,800 rupees a year ($40, £25) to send him to school. In this part of West Bengal that is a lot of money. Many poor families simply can’t afford to send their children to school, even when it is free. Chumki Hajra is one who has never been to school. She is 14 years old and lives in a tiny shack with her grandmother. Their home is simple A-frame supporting a thatched roof next to the rice paddies and coconut palms at the edge of the village. Inside the hut there is just room for a bed and a few possessions. Every morning, instead of going to school, she scrubs the dishes and cleans the homes of her neighbours. She’s done this ever since she was five. For her work she earns just 200 rupees a month ($5, £3). It’s not much, but it’s money her family desperately needs. And it means that she has to work as a servant everyday in the village. But Chumki is now getting an education, thanks to Babar Ali. The 16-year-old has made it his mission to help Chumki and hundreds of other poor children in his village. The minute his lessons are over at Raj Govinda school, Babar Ali doesn’t stop to play, he heads off to share what he’s learnt with other children from his village. At four o’clock every afternoon after Babar Ali gets back to his family home a bell summons children to his house. They flood through the gate into the yard behind his house, where Babar Ali now acts as headmaster of his own, unofficial school. Lined up in his back yard the children sing the national anthem. Standing on a podium, Babar Ali lectures them about discipline, then study begins. Babar Ali was just nine when he began teaching a few friends as a game. They were all eager to know what he learnt in school every morning and he liked playing at being their teacher. Did school change your life? Now his afternoon school has 800 students, all from poor families, all taught for free. Most of the girls come here after working, like Chumki, as domestic helps in the village, and the boys after they have finished their day’s work labouring in the fields. Including Babar Ali there are now 10 teachers at the school, all, like him are students at school or college, who give their time voluntarily. Babar Ali doesn’t charge for anything, even books and food are given free, funded by donations. It means even the poorest can come here. Seated on a rough bench squeezed in with about a dozen other girls, Chumki Hajra is busy scribbling notes. Her dedication to learning is incredible to see. Every day she works in homes in the village from six in the morning until half past two in the afternoon, then she heads to Babar Ali’s school. At seven every evening she heads back to do more cleaning work. Chumki’s dream is to one day become a nurse, and Babar Ali’s classes might just make it possible. The school has been recognised by the local authorities, it has helped increase literacy rates in the area, and Babar Ali has won awards for his work. The youngest children are just four or five, and they are all squeezed in to a tiny veranda. There are just a couple of bare electric bulbs to give light as lessons stretch into the evening, and only if there is electricity. And then the monsoon rain begins. Huge drops fall as the children scurry for cover, slipping in the mud. They crowd under a piece of plastic sheeting. Babar Ali shouts an order. Lessons are cancelled for the afternoon otherwise everyone will be soaked. Having no classrooms means lessons are at the mercy of the elements. The children climb onto the porch of a nearby shop as the rain pours down. Then they hurry home through the downpour. Tomorrow they’ll be back though. Eight hundred poor children, unable to afford an education, but hungry for anything they can learn at Babar Ali’s school. Here are some of your comments. You can send your own comment with the form at the bottom of this story. Babar Ali is a hero (and I don’t use that word often). He, and his loyal pupils, deserve not only our total respect, but our support and encouragement too. “Be the change you want to see in others”- Babar leads by example- such a humbling story that encourages everyone. Thank you! The news is really an eye-opener. We always blame others including Government, but Babar Ali proves that we can return back to the society if we want. If there are saints in this world, Babar Ali is one of them. He sees the problems of others. If the corrupt officials could learn from this young boy, they would not waste huge public funds that could educate millions. In world were you are measured by the materials you own, (house, cars, clothes etc) it’s amazing to see a young making the most of what resource there is. Trying to improve not only the quality of his life, but others around him. A truly magnificent story about a remarkable young man. Babar Ali is indeed a rare soul, who at such a young age is filled with a sense of duty, direction and patriotism. Maybe if more youths of today were like him, the world would be a better place. After reading the hardship these children go through, I cannot help but think how lucky Malaysian children are. It’s human nature to take things for granted, some say. But I will share this story with my students. In hope that more will be inspired to be like someone like Babar Ali. I too read this story with my mouth open and with tears in my eyes. What an inspiration this young boy is. This article should be read by teenagers in the western world who take their education for granted and think that they are entitled to whatever they want without lifting their little fingers. I’ll definitely read this article to my teenage daughter. Every student in every senior school in the UK should be given a copy of this at the beginning of each school year; to remind them of how privileged they are living in this country. What BABAR ALI is doing is unquantifiable. I wish the local authority could give him a helping hand in order to take this ‘school’ to where he has in mind. He is a young man of vision and the whole world should stand up to help the guy. It’s high time we stopped wasting our resources on things that doesn’t have a good end result. This is a project that could go a long way in alleviating illiteracy if given the necessary support. Say me well to him and tell him we are praying for his success. Very inspiring! it takes me back 30 years as my uncle used to do exactly the same in my native village which had one school where he used to work and had his informal classes for poor students at home. Mr. Baber Ali, I salute you. What a truly remarkable chap ! But hold on, isn’t this India, the world’s largest democracy? Doesn’t anyone there want to legislate to make education state funded and available for all? What about abandoning their nuclear weapons and space programme to allow this to be funded. A powerful example set by Mr. Babar Ali. After reading this article, I feel like going back home to my village in India and do something like this. Just Phenomenal! Stories like Babar Ali’s are inspirational and life-changing. If the smallest percentage of readers the world over get inspired to give back in some form to further education in such villages, the Indian story will be one of enlightenment. It’s young people like this who really make the world turn and people stand up and realise that there is more outside of our little corners that is far more remarkable than we could ever achieve. This is a great story. I come from Calcutta, W Bengal near to the place Babar Ali is doing this great job. I am going to Calcutta in November. I will positively visit the school, meet Babar Ali and will donate anything my resources will permit to support his mission. To influence one life is itself amazing, and here is Babar, at 16, influencing and changing 800 lives for their betterment. Hats off to him and I hope somebody from the West Bengal Education department read this story and hopefully reacts soon!! A little ray of light in all that darkness. I reckon this guy deserves the Nobel prize for peace right now. Obama could have waited a year. I have no words. It just makes me think that I should not complain about anything and take things for granted. Quite Amazing! Does this happen here in our planet? Ali is doing something which many other could think to be fictitious. The United States and all other other 1st world countries should support this young person give him the nobel peace prize, more education more peace I believe. I can’t believe this, what a remarkable young man! I read this article with my mouth open. Thanks for this article BBC it makes me truly, truly humbled. Babar Ali is a great soul. He will change lot of young lives. This is truly a remarkable story. The higher education system in Great Britain USA and should recognize Babar Ali and help him all the way in his noble cause. This article is like a cold shower that woke me up. my parents pay thousands of euros to my uni every year to give me an education. 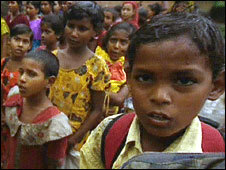 Realising that with the same amount of money all these children could much easily get education hurts. It hurts realising i have the chance and the means to learn, but I’m even complaining for having “too much to study”. To see i have Facebook open instead of a book. We do need articles like this, we do need to wake up. No doubt, wherever Mr Babar Ali goes, even highly educated and positioned people will stand and respect him. I salute Babar Ali and pray for the future to be bright and prosperous for ‘The Head Master’ and his ‘Pupil’. May God, through the Government, fulfil their desire. What an extraordinary story!! It nearly brought tears to my eyes. What dedication and commitment in such dire poverty from all these people. I personally never had any such problems and quite frankly could never dream of any as I was blessed to be in free state schooling in the UK. However, when I read the story of Babar Ali and his students, it makes me feel tiny. Thank you for bringing this story BBC. What a wonderful kid, if only we can get his type within our community, we could be better off. Instead of our graduates to be sitting down under trees to argue unnecessarily they can borrow a leaf from Babar Ali. The world needs people like these with the conviction to make a CHANGE in others lives. I was deeply humbled by Babar Ali’s story. So many people so many parts of the country take education funded by the government for granted. Deliberately missing lessons etc. And here are some 800 kids who’ll do anything to get educated, to be better, thanks to this extremely remarkable teenager. We should be ashamed with our selves if we at some point took things for granted. It’s cost over $50K for my education as a primary school teacher. I wish I could have sent it to them instead! India is in the process of a social change and it is the youths like Babar Ali who are trying to bring this change. It is people like him who are trying their bits and they have kept alive the hopes of numerous people in India whose lives are not rosy but every night they sleep in the hope that tomorrow will bring something good. No comment. It’s just wonderful.